Plus, close encounters with an alleged ethereal spirit in the digital realm. Jump this week introduces a new character set to appear in Digimon Story: Cyber Sleuth. Eater, designed by Ito Ogure, is a glitch within cyberspace that appears without warning one day, consuming the data of humans and Digimon alike indiscriminately should they get too close. 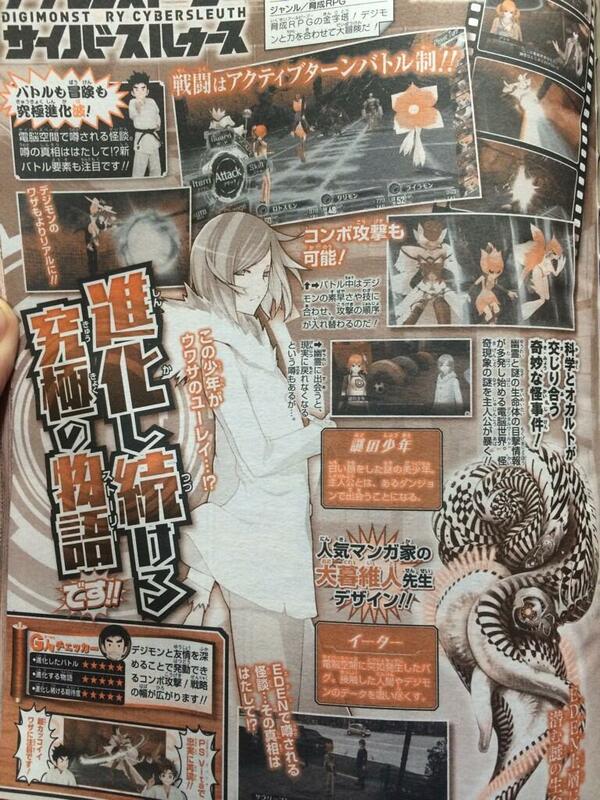 Another character, the ambiguously dubbed “Mysterious Boy,” is also showcased in the magazine. Sporting a white wardrobe, rumors circulating within the game contend that he’s a spirit and that anyone who meets him will be unable to return to the real world. Details beyond that are sparse, save for the fact that the protagonist will, in fact, bump into him at some point. A handful of details have also been divulged pertaining to the game’s battle system. Utilizing a system dubbed “Active Turn Battles,” combat revolves around the ability to shift turn orders for Digimon, which is dependent on variables such as their speed and the techniques used. Combo attacks also play a part in the game, which can be triggered upon attaining sufficient bonding with a Digimon. Digimon Story: Cyber Sleuth is in development for PS Vita.